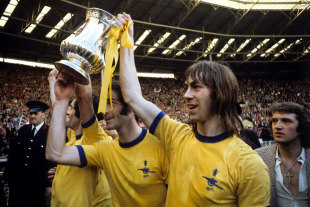 The Arsenal first wore a golden Yellow shirt in the FA CUP final in 1950 and again in the 1971 final. From elder fan’s I have spoke to the “she wore a yellow ribbon” song was sung in the late 50’s but took until the 70’s to really become popular. Like all football songs old and new they are ripped off from a popular song and ‘she wore a yellow ribbon’ comes from a 1949 John Wayne’s film of the same name. 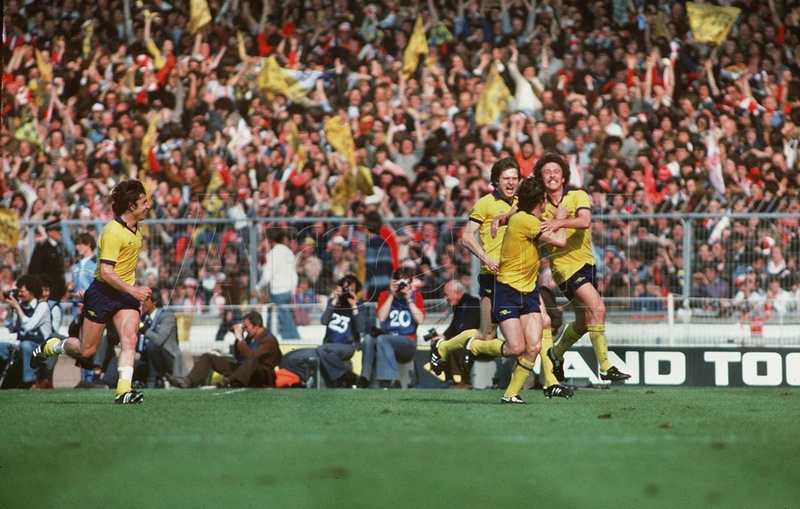 It become a song that was sung in different army regiments as well as other football clubs, West Ham and Villa have a claret version, but it was The Arsenal that made the song our own with 3 cup finals in a row 1978/79/80. This website was formed in 2007 and named after the song and in 2011 when the club ran the competition ‘build a banner’ a ‘she wore a yellow ribbon’ banner was made and sits proudly in the North East corner of the ground. 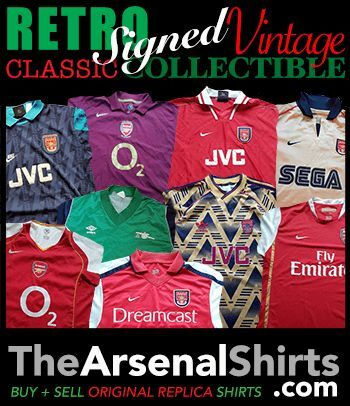 This entry was posted in Arsenal and tagged Arsenal, Arsenal F.C. supporters, FA Cup, She Wore, She Wore A Yellow Ribbon on March 8, 2014 by goonersx. Do you have any of these polo shirts left at all please? Im having a debate with a United supporter. They use scarlet instead of yellow and said Arsenal copied their version! And claims they started it in the 70s. Anyone got info that could help a gooner out. 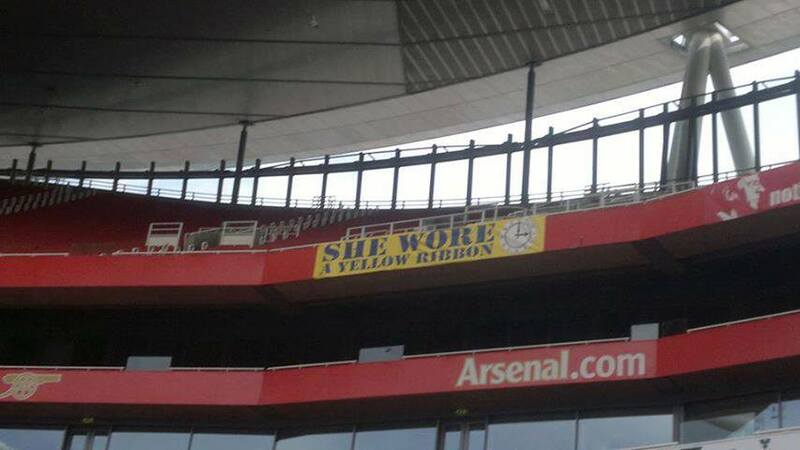 Song | She Wore A Yellow Ribbon <Liked it! Just a piece of trivia but the film She Wore A Yellow Ribbon has been shown on tv more than any other film as it was used as a trade test transmission twice per day for 2 years from 1967 when the BBC first started broadcasting in colour on BBC 2. She wore a yellow in the merry month of May. And when I asked why she wore that ribbon, she said its for the Wire and they’re off to Wembley. One more sleep til the big day enjoy it COYG!!! intelligent. You realize therefore significantly relating to this subject, produced me personally consider it from a lot of varied angles. Reblogged this on kojodarko's Blog. the ground is better offered when it’s left unturned.